Hello!! It wasn´t a very good night, but the clouds couldn´t beat me. I took my pencilbox and carry out my new Dobson 8″. It was a very nice experience though. 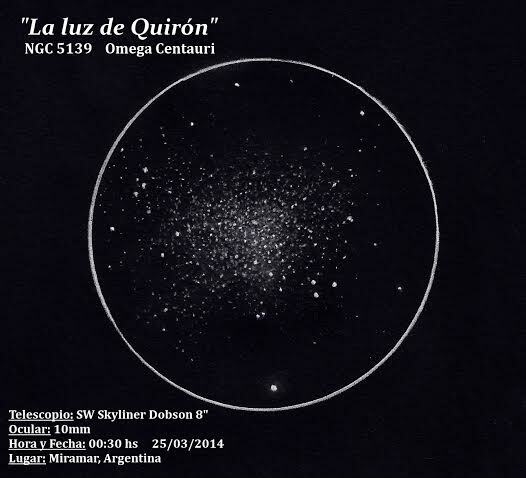 This is my first sketch of a globular cluster! My eyes couldn´t bealive how beautiful this object is, thats why i choose it for my sketch. Thank you so much for publishing it!!!!! 😀 Best regards! Desde el primer momento sabia que este dibujo terminaria aca, felicitaciones Amigo! A fine sketch of a very large Globular.